Start saving as early as possible —Time is on your side when it comes to the power of compounding interest. Even if you’re not able to contribute a lot at the start, every little bit helps. Location, location, location—When it comes to investing, don’t put all your eggs in one basket. You want a diverse portfolio but don’t overdo it. Three or four funds should suffice. Remember Enron—The lesson we all should have learned from that disaster is to limit the amount of funds you have in your company stock. As a rule of thumb, don’t hold more than 25% of your portfolio in your company stock. Less is more—Resist the urge to constantly tinker with your 401(k). Once you’ve chosen an asset mix, only rebalance your portfolio once a year. Any more than that and you risk chasing yesterday’s winners. Cash isn’t always king—If you change jobs, don’t cash out your old 401(k). If you’re happy with your portfolio, leave the 401(k open. If you’re not happy with it, your best bet is to roll it into an IRA. You will avoid taxes and withdrawal penalties as well as have more options and flexibility. Leave the loans alone – While it may be tempting to take a loan from your 401(k), this can be a risky move. If you leave the company before you have paid back the loan, the full amount will be due. If you don’t have the funds, expect to pay a 10% penalty and be taxed on the outstanding loan amount. Fees add up – If you read the prospectus for the funds offered in your 401(k), you should see something called expense ratio or similar. This indicates the percentage of fees you pay for owning that fund. The numbers will usually be small, such as 0.75% or 1.5%. It may seem inconsequential but it isn’t. As little as 0.5% difference in fees can add up to thousands of dollars you WON’T have during retirement. When choosing your funds, be sure to beware of the fees. Don’t be afraid to ask for help, but ask for the right kind – Many plans offer advisors to assist your with your allocations. While this may be a good option for some, beware of fees again. Don’t accept help that is based on a percentage of your assets. This is just a way for an advisor to continue to make money off you. Look for a fee-only advisor. This way you know what you are paying and it should be a one-time fee, not ongoing payments. 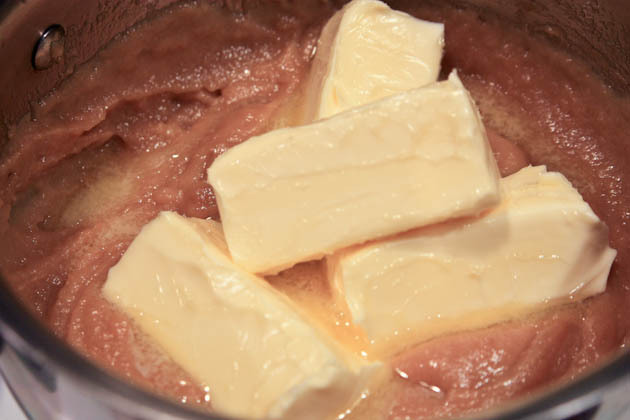 In the bowl of an electric mixer, cream together the butter and cream cheese until smooth. Mix in the egg and vanilla thoroughly. Beat in the cake mix and then the dried strawberries. The mixture will be very sticky, but that’s ok, it’s nothing a little powdered sugar can’t handle. Put powdered sugar in a bowl. Coat your hands in powdered sugar and pinch off some of the cookie dough, roll into a ball about 1″ in diameter and dredge in the powdered sugar then place on the baking sheet. Keep using the powdered sugar to coat your hands in order to work with the dough. Place the balls about 2″ apart on the baking sheet and bake for 12 minutes, rotating and switching racks halfway through to ensure even baking. Let cool on pan for 2 minutes and move to a cooling rack and let cool completely. 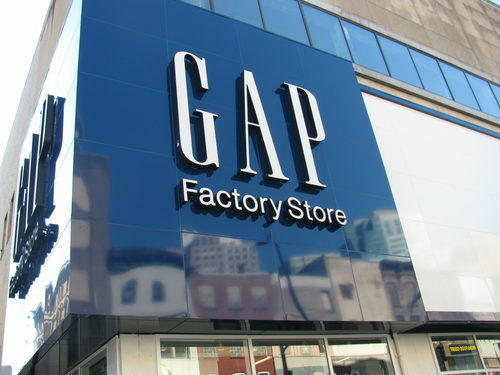 There’s a Gap Outlet Factory Store in NYC? New York opened it’s first Gap Factory Outlet on Monday on 400 Fulton Street, and is the newest hype of town. Gap Outlet is one of the mainstream brands taking over the stores at Fulton Mall, but it seems like everyone is overjoyed by this. The line was longer then we’ve ever seen, and when speaking to several people in line – most are wondering if the cheaper tshirt is worth standing on line for several hours. The merchandise is basically what you would expect: affordable, with a lot of additional deals. Women’s wide leg denim trousers are $64.99 with an additional 25% off, striped dresses are $59.99, and sandals are $26.99. In the men’s department, you can get graphic t-shirts for $26.99 and plaid shorts for $34.99, both with an additional 20% off. Boys, girls, toddler, infant, and newborn sections follow suit. If you happen to stop by, let us know what you think? It’s leap year day! And for today only Kodax Gallery has buy 1 get 1 free sitewide. Hurry and turn those lovely pictures into awesome items for ourself or loved ones! The amount of sweets I’m craving these days almost makes me suspect myself being prego again (no I am NOT reader), but still. Napoleon is one of my FAVORITE deserts of all time. Cream, pastry – yummy goodndess. Here is a recipe I found that I love. I think I need to make it again soon. 1 lb package of Puff Pastry (Pepperidge Farm brand), thawed according to package instructions. 1 large sheet of parchment paper. 1. 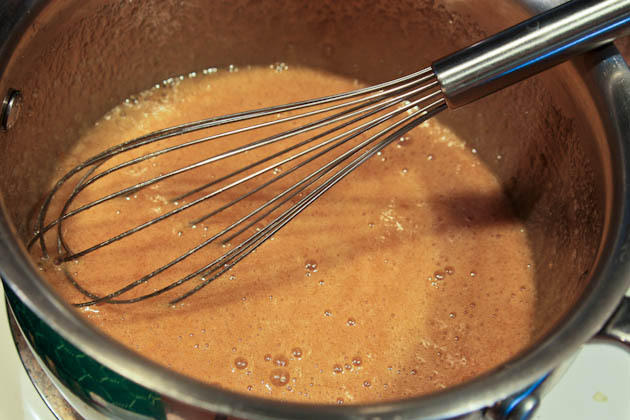 Whisk eggs and sugar in a medium sauce pan – do not beat, just mix. 2. 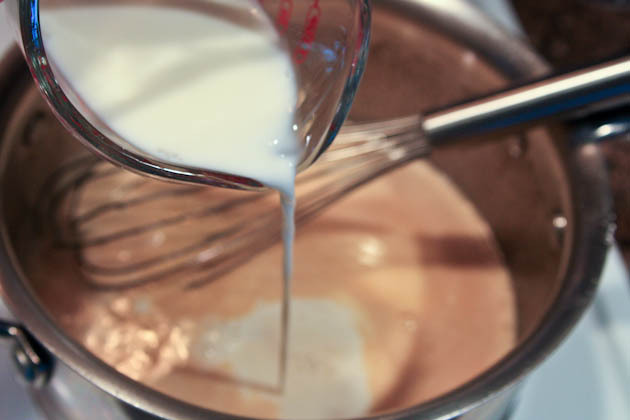 Whisk in milk and flour and put the pot on medium-low heat. 4. Remove from heat and let it cool for 15 to 20 minutes. Prep the puff pastry in the mean time. 5. 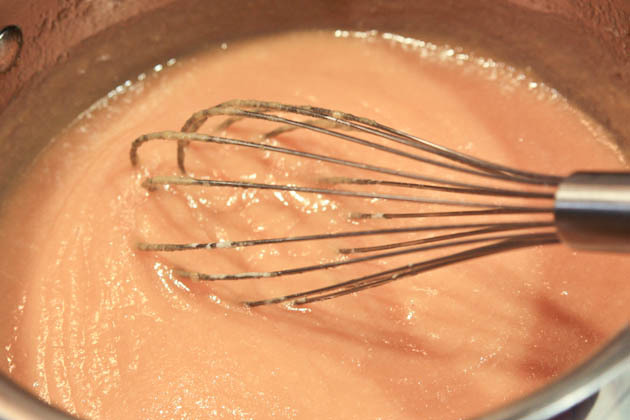 Once the mixture has cooled a little, add softened butter to the cream and beat the mixture on medium/high speed for a few minutes. Add 1/2 tsp vanilla powder. The cream is ready. 1. 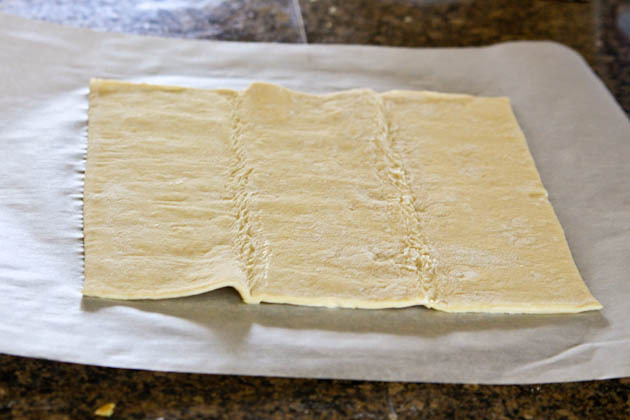 Roll 1 of the puff pastry sheets onto a large sheet of parchment paper until the dough is double in size and nearly see-through. Thinner is better! 2. Cut the rolled out sheet into 4 equal squares (about 6″x6″ each). 3. Poke Holes all over the top of the pastry or it will puff up. Make sure to really poke all the way through the dough. 4. 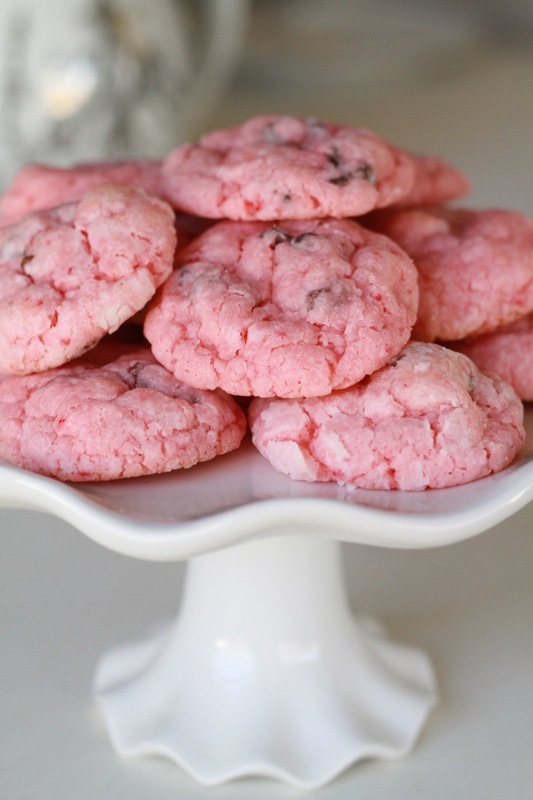 Place the parchment paper with dough onto a large cookie sheet. Bake at 400 degrees F for 12-13 minutes or until tops are golden. 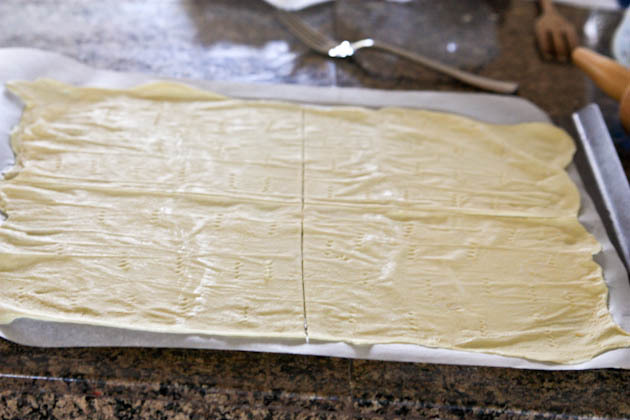 Set pastry aside, and place the same parchment paper on a cool surface. 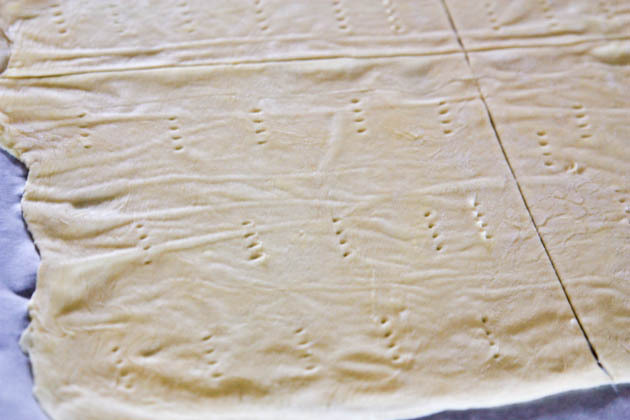 Re-use the paper to roll out and bake the next sheet of pastry. 5. Repeat steps 1 through 3 for the second sheet of pastry dough. 6. Once the frosting is finished, assemble the cake by placing 2 sheets of pastry side by side and spreading a generous amount of cream over the top. 7. Repeat with all of the pastry. Before glazing the top, gently press down on the cake to make it more compact. 9. Top with chopped walnuts or fresh berries. Over the weekend we went to a cooking playdate. It was great! The girls got to help out and even ate what they made. Inspired me to look up more recipes that are easy for kids to help in so I can make it with my kids. I came across this one – Ham & Pineapple Pita Pizzas – simple and who doesn’t love pizza and pineapple! yum! Bake until the pitas are crisp and the cheese has melted, 10 to 12 minutes. Make sure you don’t have this in your medicine cabinet! 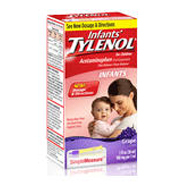 McNeil Consumer Healthcare Division has announced a voluntary recall of approximately 574,000 bottles of Infant Tylenol Oral Suspension 1 oz grape. The medicine is used as a pain reliever and fever reducer. The lot numbers that are being recalled are BIL0U00, BIL0V00, BIL3500, BJL2D00, BJL2E00, BJL2T00 and BJL2U00, with the UPC code 300450122308, so check your bottles. The recall was announced as a precaution after the company received a few complaints from parents who had difficulty using the product’s “SimpleMeasure” dosing system. The system includes a dosing syringe that the parent inserts into a protective cover (or “flow restrictor”) at the top of the bottle to measure the proper dose. There were reports of a malfunction because the flow restrictor was pushed into the bottle while the syringe was inserted. If you have this medication and the flow restrictor is pushed into the bottle, you shouldn’t use it. You can request a refund by visiting Tylenol.com or contacting McNeil at 1-888-222-6036, Monday to Friday 8 a.m. to 8 p.m. Eastern Time and Saturday-Sunday from 9 a.m. to 5 p.m. ET. If you still have concerns, contact your doctor or go to Tylenol.com. Get more of the latest news on recalls here. A layer cake is any cake that is made up of more than one layer. There are 2 layer, 3 layer, 4 layer and even 7 layer layer cakes! The layers are most often made from the same recipe but sometimes a baker will use different types of cake for the different layers. For example, one type of layer cake has a layer of yellow cake, a layer of buttercream, a layer of crispy meringue, a layer of buttercream, and then a layer of yellow cake. Generally a layer cake will be a circular cake made in eight or nine inch pans, but some are made in square or other fancy shaped pans. Grease pans and sprinkle with flour. Shake pan so the flour coats the pan completely, bottom and sides. Stir the flour and lightly spoon it into the measuring cup. Level off the top gently with a knife. 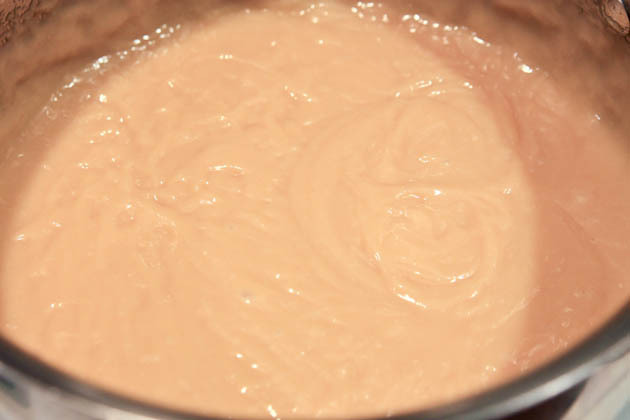 Measure half the batter into each prepared pan and level top. Batter should only be about halfway up the sides of the pan. Let cool in pans for ten minutes, run a knife around edge to loosen the cake, and then turn out on counter to finish cooling. When the cake is cool, if you have time, freeze it for easier frosting. Slice off the rounded part on the tops of the layers to even them out. Place the first layer, cut side down, on the cake plate. 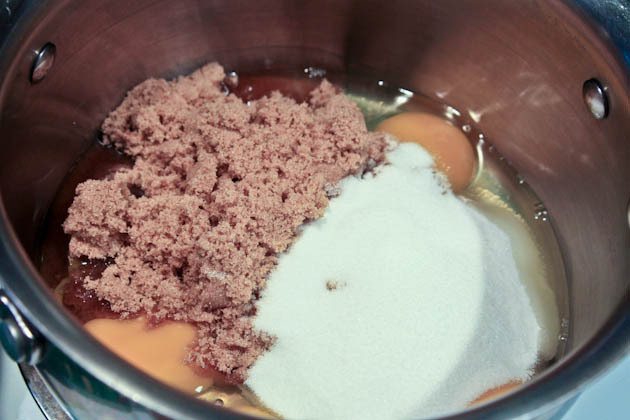 Put about 3/4 cup of the frosting in the center of the cake and spread to the edges. Place the next layer on top, cut side down. Frost top and sides of cake with a thin layer of frosting. Freeze for about 30 minutes. Finish the cake by smoothing the rest of the frosting over it. Smooth sides and top. 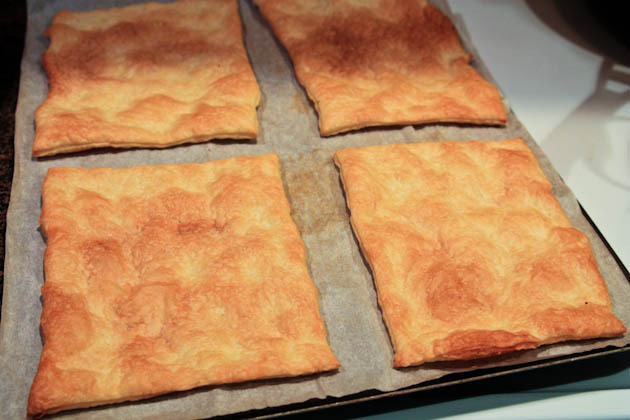 One side higher- oven heats unevenly, batter was put in pan unevenly and not smoothed out. Like anything else, making a good cake consistantly takes time and practice. Be patient, keep trying, and before long you will be turning out better than bakery quality cakes that you will be proud to serve. Once you have the basic method down try other, more complex recipes to keep challenging yourself and to hone your skills. With my first baby, I bought a mid-range standard high chair. We chose it because it had fun features like storage basket, and a toy bar. I had visions of a sweet baby happily sitting playing with her toy bar a as I cooked dinner. Little did I know that both would end up being nothing more than crumb catchers, and just something else I had to clean! Not to mention that it had a ridiculously huge foot print. Even with the casters it was a hassle to clean the floor beneath. After the second child my high chair became part of the baby gear relocation program (aka Grandma’s house). I was determined to find a more practical and cheaper alternative. I never used these, but have friends who swear by them. They are up out of the way, and the baby sits next to the table just like all the other family members. With the Chicco 360 Rotating Hook On High Chair (MSRP $70), the seat rotates to make feedings a bit easier than them always facing forward. It also has a carrying case for travel and folds flat. Although hook on chairs fit most tables they aren’t appropriate for glass top tables, bar counters, or attached to a leaf in a large table. Be sure to keep the receipt just in case you cannot get it to properly attach to your table. Also, your baby needs to be at least 6 months old to use it as they have to be pretty much sitting on their own. I just used the swing, or bouncy seat to feed my baby before she was able to use the chair. The maximum weight limit is 37 pounds which is about the size of a 3-4 year old. These are seats that strap directly to your dining room chair. The main advantage is a seat like Fisher Price’s Space Saving High Chair (available in several different patterns) gives you all the amenities of a standard high chair without taking up so much room. They recline for infants, have dishwasher safe trays , and becomes a toddler booster seat. The problem I see is that there are lots of nooks and crannies for jam and crumbs to get stuck making for a yucky clean up time. Also, an older baby or toddler can push off the table with his feet tipping the chair backwards. Be careful to always use the tray, and keep it a safe distance from the table. At round $50 they are a bargain compared to traditional high chairs, but offer all the features. I prefer the more simple plastic models like the Fisher Price Healthy Care Booster Seat. It is a breeze to clean as there are no crevices, and the dishwasher safe tray has a lit to keep it clean when not in use. There is no recline for infants, and the minimum age is about 6 months. They do however easily fit in the trunk of a car for trips to a friend’s house for dinner. They also easily detach from the chair so your little one can snack in the living room or playroom if needed. At around $25 to $40 these are a great option for parents on a budget. Fisher Price, Graco, First Years, Summer Infant, and Prince Lionheart all make these in various colors, textures, and with different features. Some even come with toys. Those with trays are appropriate for six months up, and those without trays are probably better suited for bigger toddlers. This is an awesome little gizmo that brings the seat of the chair closer to the table. It fits on the bottom of most chairs, and has two different heights. I love it because there is no extra seat to clean, and children feel more grown up sitting without a booster seat. It does elevate the chair so you want to be sure your child is mature enough to sit in a chair without falling out. I wouldn’t recommend this for children younger than 2.5 or 3. So what are you doing as a high chair option at home? Apparently there’s new school zones throughout NYC and the maps on DOE are not accurate. Way to go NYC DOE! Check out Mommypoppin’s blog about where to find the right map. Check out the article here to find out what school zone you live in. It’s best to read and learn all about it as kindergarten deadline is around the corner (March 2nd).